When is the best time to visit Six Flags Over Texas? 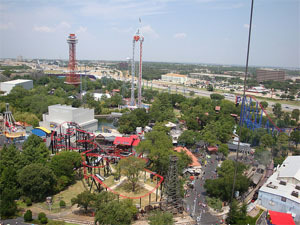 The oldest of the Six Flags chain, Six Flags Over Texas is one of the most popular theme parks in all of Texas. With more than 50 rides, including 13 roller coasters, the park attracts throngs of visitors and thrill seekers throughout the year. So, when is Six Flags Over Texas least crowded? Here are some of the best and worst times of the year to visit the park. New Year’s Eve/Day – Crowds for the annual Holiday in the Park event are still around on New Year’s Eve (December 31). By New Year’s Day (January 1) though, which is typically the last day of the operating season, everyone’s at home with a hangover. Crowds are a lot lighter. Opening Day – Big crowds are usually expected for opening weekend, which is on the first Saturday and Sunday of March. Try to get there early! Spring Break – Spring Break week in mid-March is traditionally one of the busiest times at Six Flags Over Texas. The park can get very crowded, sometimes reaching maximum capacity. If you must go in March, the Sundays before and after Spring Break week are least crowded. Weekends – Six Flags Over Texas is only open on weekends in April, and Sundays are again your best bet for lighter crowds and shorter lines. Memorial Day Weekend – May marks the start of the busy summer season. Weekends, including Memorial Day Weekend, are typically crowded. It’s a lot less busy on weekdays, Monday-Thursday. Summer Season – More crowds start arriving in June as more schools get out for their summer break. The earlier in the month you go, the less crowded it’s expected to be. Weekdays early in June are the least crowded days. 4th of July Weekend – The big summer crowds are out in full force by July. Six Flags Over Texas is typically very crowded throughout the month, including for the 4th of July. Summer Season – The summer crowds are still around in August, but tend to die off toward the end of the month as schools get back in session. Crowds are expected to get lighter on weekdays starting in mid-August. Labor Day Weekend – The summer crowds are gone by September, making way for a less crowded park. It’s usually busy on Labor Day Weekend though. Fright Fest – The annual Fright Fest Halloween festival takes over in October. The event is hugely popular and draws big crowds throughout the month. Holiday in the Park – The annual Holiday in the Park event starts in the end of November (Thanksgiving Weekend) and through December. It tends to get busier toward New Year’s Eve, so the earlier in the season you go the better. Six Flags Over Texas is closed on Christmas Eve and Christmas Day. For crowd predictions of upcoming dates, as well as historical crowd ratings, check out the Six Flags Over Texas Crowd Calendar. When do you think is the best time of the year Six Flags Over Texas? How crowded was it when you visited? Be sure to let us know in the comments below! Well, I went yesterday (June 29th) and it was none short of packed. Won’t do that again! We are going spring break, but not the week of Texas spring break. We are from OK and going the the 20-21; it’s only open Thursday and Friday. We figured Texas schools were not out then and were hoping for lighter crowds. What can we expect? That’s what I’m thinking too. It should be more manageable on those days than the previous week. Do you think the actual Columbus Day itself will be crowded? Since a lot of folks still do have school and work? Yeah, it’s not that big of a holiday, so I’m thinking it won’t be too crowded on Monday. How busy will Six Flags be on Sunday, November 2? I’m not sure if Fright Fest will still be going on then, and I understand that it can get really crowded during which. Thank you! That’s the last day of Fright Fest, but I don’t think it will be too crowded. It’s usually more manageable after Halloween. Is Thanksgiving weekend heavily crowded? I feel like this is a heavy travel holiday and most people will be spending time at home with the family (which we don’t). Thanks! I’d be prepared for it to be busy that weekend. The Friday and Saturday after Thanksgiving is usually crowded. Sunday should be a little more manageable though. Get there early! We went yesterday and it was a nightmare. The weather was great, and the high school choirs were there to sing throughout the park. That made a large crowd and lines were all over an hour the good ones more like two hours.